Cluster Dress Ring Using the Customer’s Diamonds — Form Bespoke Jewellers Ltd.
A bespoke cluster dress ring using the customer’s diamonds. The customer came to us with a collection of diamonds that they already owned. They were look to remodel them into a bespoke, flower design. With the guidance of our expert Yorkshire jewellers, the design was finalised and created on CAD. This creates a 3D digital image of the design which really brings it to life for the customer. The design was then cast in platinum. 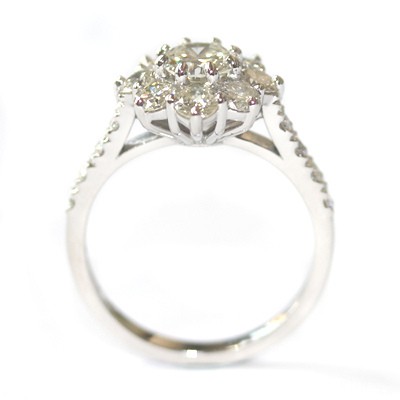 Each of the customer’s round brilliant cut diamonds was set by hand into the cluster head and shoulders of the ring. 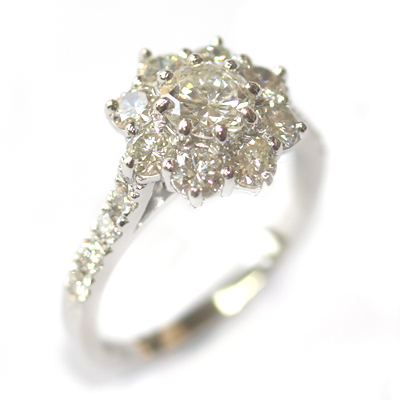 A beautiful, bespoke cluster dress ring, using the customer’s diamonds.